It all started back in August of 2011. 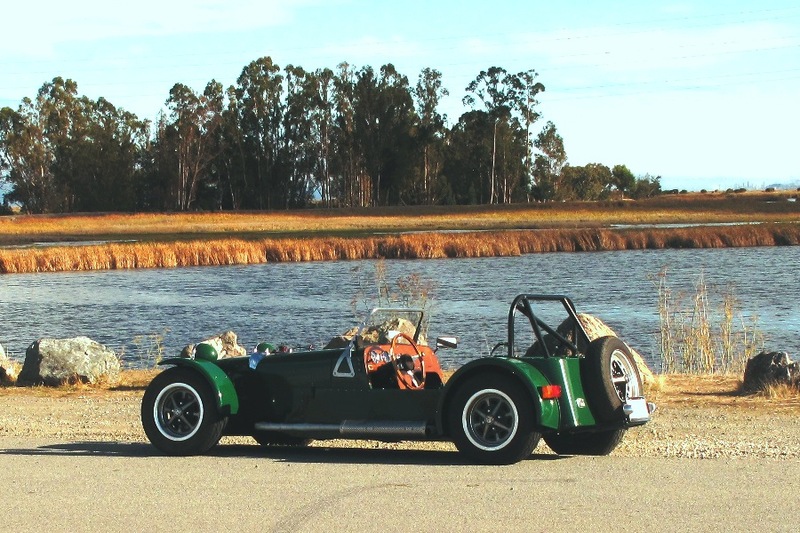 After years of research and planning, or at least a few weeks, we set out to build a Locost sports car from scratch, using a homebuilt frame and parts from a 1972 MGB roadster. To the stunned surprise of friends and family alike, we finished the car in October of 2013, at least based on our definition of finished. Throughout the build we posted our progress every so often here on this website, and ended up with a novel-length build log. If that seems like a little bit too much to read right now, this page presents just the highlights. We began the project, as most Locost builders do, by cutting tubes for the frame. About halfway through that task we decided to build the front suspension, for no other reason than it looked like fun. But looks can be deceiving, and just about everything that could go wrong with building A-arms went wrong. However, after a long succession of broken tap handles, inaccurate jigs, and too-short tubes, we finally prevailed, and the A-arms were welded up in December, 2011 by an exceptionally gifted TIG welder from the People's Republic of Berkeley. Incidentally, the frame in the photo above is not our actual Locost frame, but rather a wood mock-up we built a few years earlier. It was handy to have around for fitting and measuring the location of various parts, including the engine and transmission. Besides saving us from lots of do-overs (though not all of them), it was cool to sit inside and pretend to blast down twisty back roads, roar of the engine filling the air, wind in the face, tires... okay, maybe not that cool. Sorry. 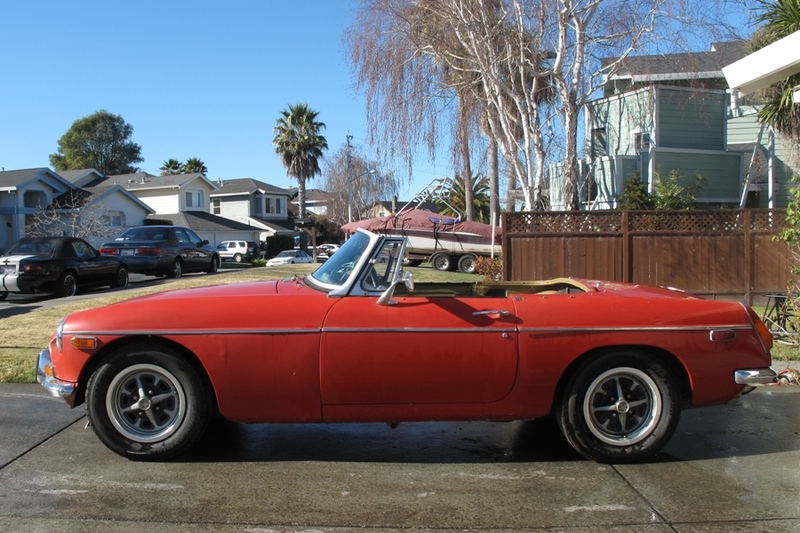 In early December of 2011, a 1972 MGB roadster showed up on Craigslist for the paltry sum of $1000. The car was supposed to be in running condition, just missing a few parts like the batteries. We took a trip down to central California to check it out, and while the lack of batteries precluded a test drive, the car was shiny and red, and we immediately knew this would be our new Locost donor. Unfortunately it took a while to actually transport the M.G. to the Locost build site, and another few weeks to get it running. A tear-down of the engine showed all of the internals to be in great shape, but after replacing the entire ignition system, we couldn't get the car to run for more than a few seconds at a time. It wasn't until we took the carburetors apart that we learned just how much gunk can accumulate in a car that sits for years. After rebuilding the carbs, the engine started and ran flawlessly. So we immediately stripped the car of all the needed parts, and a few unneeded ones, and dispatched the chassis to the dismantlers, where we're told it went to a good home. Over the life of the project we acquired many new tools, learning how to use them as the need arose. 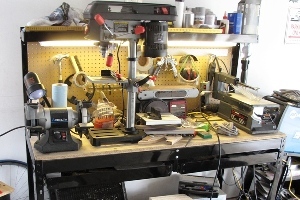 We started with a chop saw, Dremel, hand drill, and bench grinder, and eventually added a belt sander, drill press, tap-and-die set, angle grinder, and several cool measuring devices including a dial caliper and digital protractor. There were times when it would've been nice to have a band saw, a mill, or a lathe, but we came to learn after some time just how much fun and satisfaction you can get out of building a whole car using only simple hand tools. 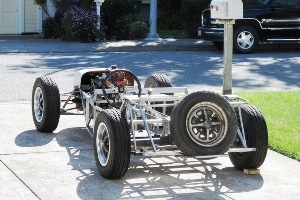 In May of 2012 we completed building the basic space frame chassis, which was pretty exciting as we now had something that looked like an actual car. All of the steel tubes for the chassis were cut in the early stages of the build, so the frame went together quickly, but not without a few issues. The frame is pretty much a standard "book" frame, however our donor definitely isn't, and not everything fit exactly as planned. The only major do-over was the rear bulkhead, which had to be rebuilt to accomodate the huge M.G. differential housing. One thing that surprised us on this project was the sheer amount of welding involved, and how much your welding improves over the course of the build. 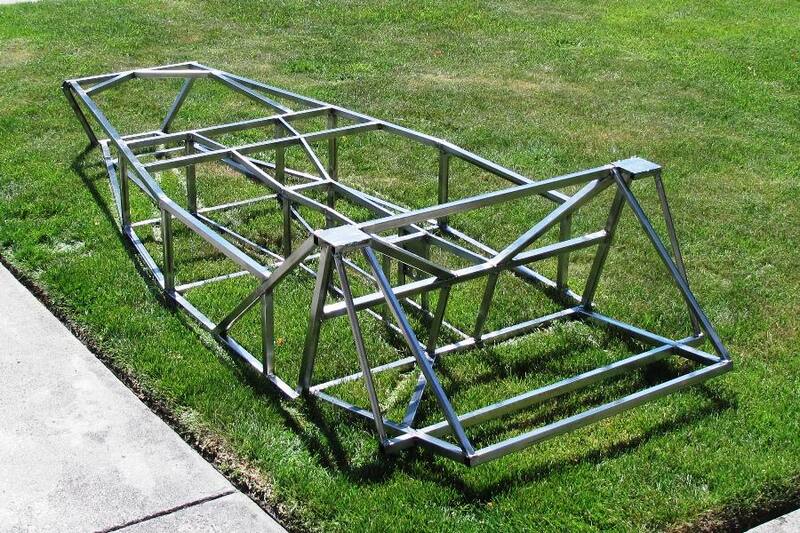 With more than 500 welds on the basic frame alone, welding the frame takes weeks, not days. Spend a few days practicing on scraps and it'll help a little, but the fact is, even after 500 welds you're still improving. There's a lot to learn. That said, you really can start one of these things with little or no experience, and by the time you're halfway done your welds will be pretty respectable. 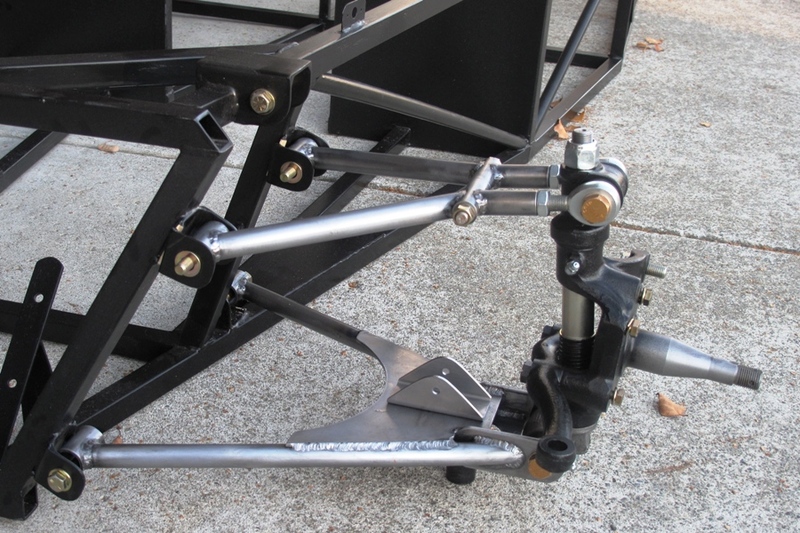 Once the basic frame was complete, we spent the summer of 2012 welding on brackets so we could mount things like the radiator, fuel tank, seat belts, suspension, pedals, spare tire, and so on. It turns out a Locost frame needs a lot of brackets. It also turns out that most of them needed to be re-engineered for our donor. However, since we're not actual engineers, but only play them on the Internet, we did what we could but likely ended up with a lot more metal on the car than was probably required. And actually we're okay with that. As you might guess, fitting all the parts from an MGB into a Locost space frame chassis was an exercise in efficient packaging. 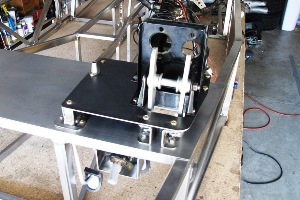 The pedal box and steering column mounts had to be designed from the ground up. We had to shoehorn the fuel pump in between the passenger seat and the rear axle housing. The radiator mount is similar to the one in the book, but only if you count the fact that it's in approximately the same place. The motor mounts look like nothing we've ever seen before. They seem to be holding the engine in place so far. While working on bracket designs, we made a tough engineering decision to not shorten the steering rack. No matter how we worked it out, we had clearance issues. We ran into more than a few of those along the way, sometimes because of our choice of donor, and sometimes because we didn't plan well enough ahead. The good news is, the rack worked out perfectly and the car has zero bump steer. One thing we started doing early on was welding blind nuts on our brackets wherever we could. This has made assembling and disassembling the car a lot easier. We had to do a lot of that over the course of the build. 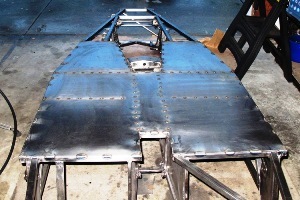 By the end of the summer of 2012, with most of the brackets welded on, the chassis was essentially complete, if you ignored things like the floor, which we were more than happy to do. 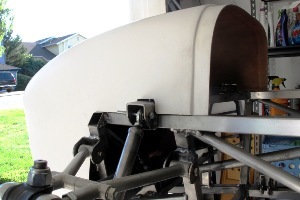 We had worked out the location of just about every component on the car, and had even gotten a start on the bodywork, with a cool-looking fiberglass nose cone from Kinetic Vehicles in Oregon. So the build was moving along nicely, and it seemed that most of our engineering and design work was behind us, although that didn't quite prove to be the case. In September of 2012 we installed the engine. 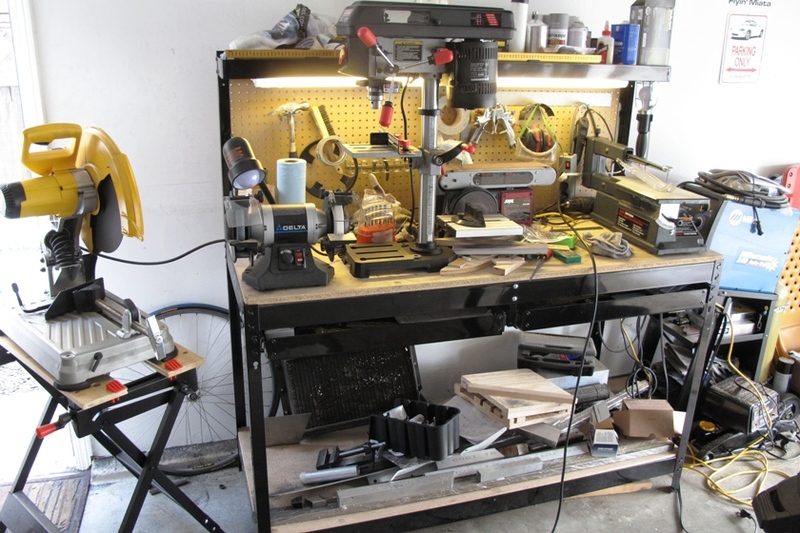 To do this we first stripped the frame bare, then removed our long-suffering build table from the garage. 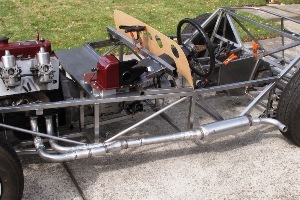 We next dropped the lightweight chassis over the engine and transmission, bolted on the mounts, and then tack welded the mounts to the frame. 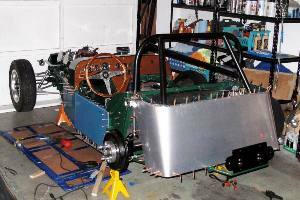 Once that was done we reassembled everything back onto the chassis and rebuilt the suspension. 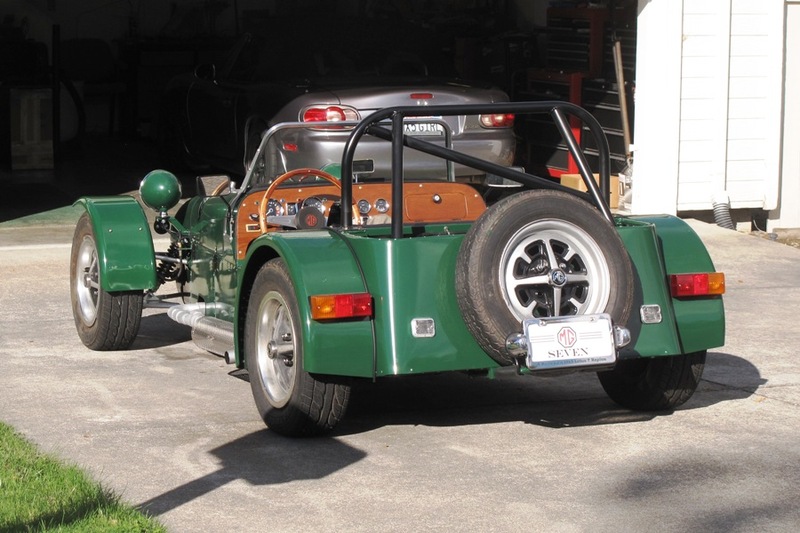 The real excitement came when we bolted on the wheels and rolled the car out of the garage for the first time. We had intended, once we'd reached the rolling chassis stage, to pull the engine, strip the chassis, and finish all the welding. We could then paint the frame, install everything back in the car, and start working on all the systems we needed to get the car running. But we quickly abandoned that strategy. We decided instead that the best approach would be to build all of those systems right away, starting with the cooling and exhaust. We decided this partly in case we had to make any more changes to the frame, and mostly because we liked having the car on its wheels. The first thing we did was install the MGB handbrake, so we could stop the car in case we ever found it out on the street. We also built a mock-up of the dashboard in order to get an idea of the interior ergonomics, which weren't perfect but we made them work. Later on we cut out and trimmed to fit most of the sheet metal panels that would be welded to the transmission tunnel and firewalls. Fitting the giant panel for the floor was left as a later exercise. Both the cooling and exhaust systems went together much quicker than we expected, in part because we had no idea how to do either and so we expected lots of problems. But we managed to find coolant hoses that fit perfectly, and it turns out that exhaust pipe manufacturers really know what they're doing. So both those systems were done, but we didn't stop there. We added more brackets to the frame for things like the ignition coil and the horns, and finished the spare tire carrier and license plate mount. With all of that done, the car was really starting to look like something you could drive away. So of course the next thing we did was take everything apart. This gave us the opportunity to fully weld things we'd only tacked together before, like the engine and transmission mounts. It also allowed us to play around with routing the wiring and the fuel and brake lines, and weld on tabs for securing wires and tubes to the frame. 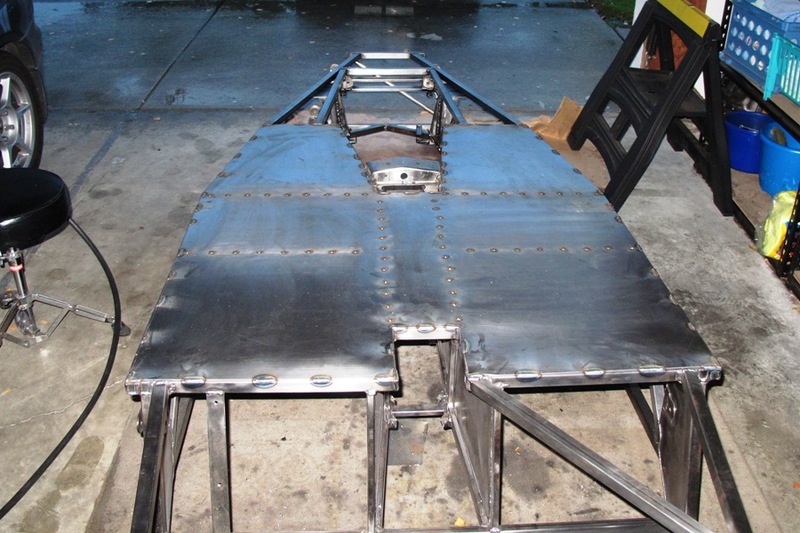 Our last big step for completing the chassis was welding on a dozen sheet metal panels, including the rear kick panels, the sides of the transmission tunnel, the firewalls, and the floor. These parts not only looked good, but they really stiffened up the chassis. The car feels like it's just one solid chunk of steel now. 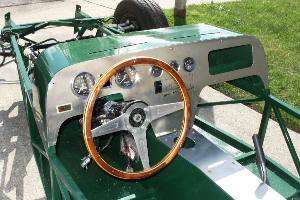 The final touches were the aluminum rear bulkhead, a pair of aluminum covers for the transmission tunnel, and a removeable four-point roll bar, built from a kit and bolted to the Locost frame with grade 8 hardware. In January of 2013 we welded some sheet metal bodywork over the scuttle, and added seat belt mounting tabs to the roll bar. With those two tasks in the books we hung up our welding gloves. 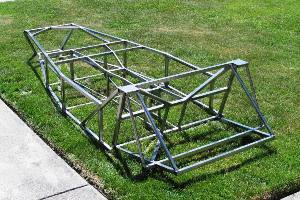 The chassis was complete, as were all parts and assemblies that required any welding. In less than a year we had gone through four cylinders of Argon/CO2, and almost two full spools of welding wire. We made close to two thousand welds overall before we were done. With the welding phase of the operation complete, we started painting. 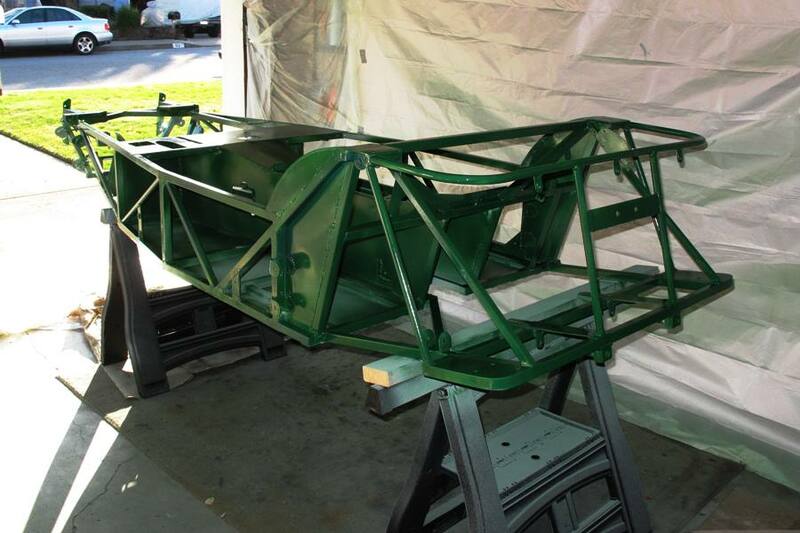 Besides the chassis, we had over 50 separate items to paint before we could start putting things back together. Some of the parts were small, like the fuel pump mount, but a few were major components like the differential, exhaust, and the aforementioned roll bar. We didn't really schedule time for painting anything more than the body and frame, but we managed to squeeze the rest in while prepping the chassis for its three coats of primer and BRG enamel. 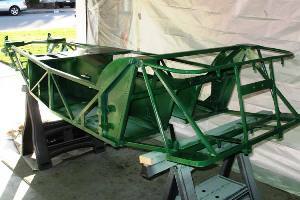 Once the chassis paint was dry, or maybe a little before, we started assembling the car for the last time. After bolting on the suspension and before dropping in the engine we ran all of our brake lines, fuel line, clutch line, and wiring harness through the car. The wiring harness came straight from our donor M.G. The brake and clutch lines were brand new pre-cut and pre-flared lines for an MGB, some of which were a little bit long but we managed to get them all clamped in place without too much extra slack. The fuel line was cut to the proper length from 5/16" aluminum tubing. We also cut out the dashboard from 6061-T6 aluminum and mounted it to the scuttle, because we wanted to have at least a few of the gauges working when we started the engine for the first time. As it turned out the engine was ready to go before the gauges were, and so on a cool Friday morning in April of 2013, after a week of getting the throttle, choke, and fuel lines connected, we pushed the car out of the garage, turned the key, and the mighty Locost powerplant roared to life. Actually it coughed, sputtered, and stumbled to life, but after a few seconds it was definitely roaring. 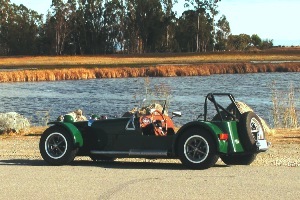 So we now had a running Locost, although we still needed a few parts before we could drive it, most notably a driveshaft. We also need to replace our fake springs and shocks with real ones, and install an actual fuel tank instead of a red plastic gas can lashed to the spare tire mount with bungee cords. Which we did in May of 2013, using a 10-gallon Jaz Products fuel cell and about $300 worth of braided steel fuel lines and aluminum fittings. As a bonus, we added a Stewart Warner sender to the tank and hooked up the fuel gauge, and it actually worked. With the Locost almost ready for it's first drive, we needed to start thinking about the seats, the interior, and the bodywork. We'd been dreading making body panels since the very start of the project, so we focused instead on the interior, at least until we'd worked up enough nerve to start cutting and bending large sheets of aluminum. 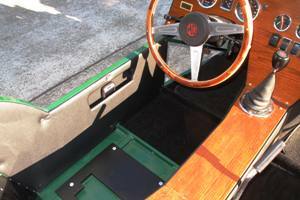 Most of the work on the interior involved covering aluminum panels with wood veneer, and then finishing the veneer with various stains and varnishes in an attempt to make it look like actual wood. We also carpeted the floor and attached vinyl-covered panels to the insides to give the car a more finished appearance. Because the car lacks much storage space, or any storage space, we even added a small pocket to the drivers side panel. We then started building the seats by constructing the mounts and cutting the plywood backing, but we left the actual foam and vinyl covering as a future exercise, at a time when we might have a better idea how to get all the vinyl pieces sewed together. As it turned out, forming the aluminum body panels wasn't as hard as we thought, so long as we maintained our usual disregard for quality results. We'd already cut out and formed the bonnet a few months earlier, and we learned a lot about what not to do, like for instance that .050" aluminum is too thick for Locost bodywork, at least if you're hoping to form the panels by hand. We ended up making most of our panels out of .040" aluminum, and the rear panel out of paper thin .032" sheet. The bodywork isn't perfect, but as always our only concern is that it looks good in photographs. 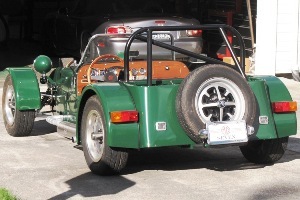 We thought that once the bodywork was painted and riveted on the car we'd be just about done, but it turned out we still had quite a few details left, including things like mirrors, seats, the exhaust heat shield, reverse lights, a grill, and much more. While working on these we also got our driveshaft shortened and installed, which allowed us to drive the car in and out of the garage for the first time ever. This gave us a good hint of just how fast and fun the car was going to be. The last few build tasks included sewing together the seats, fabricating and painting the front fenders, installing the windshield and windshield wipers, and bolting in our brand new GAZ ajustable shocks and custom coilover springs. With everything on the suspension complete, we were able to take our first drive of the M.G. Locost in the late afternoon of a cool day in September of 2013, a few brisk laps around the neighborhood. To our very great surprise and amazement, the car performed flawlessly. When we first started this project, we had no idea whether or not we'd have what it takes to build a car. It wasn't until we were more than half done, just around the time we got the car on its wheels for the first time, that it occurred to us we might be able to pull this off. Before then everything felt like an uphill battle, one giant obstacle after another, and it didn't get any better throughout the long, cold winter, as we struggled to get the car painted and assembled. But then something changed�we're not sure what�and it started to feel like we were working downhill. So it seems we made it through, but only just barely. If you divide everyone up into two groups, those who can build a car from scratch and those who can't, I think we're closer to the latter category than the former. I'm not sure how we did it, through all of the weeks and months, through summers and winters, and more ups and downs than we care to recall. Maybe we were lucky, or just stubborn. It was a bear of project, and no matter how much we thought we knew we were getting into when we started, we didn't know the half of it. But we have to say it's really all been worth it, and we're very happy with the results. And on February 15th of 2014, after a long series of visits to various state agencies for approval of our work, we bolted California license plates on to the back of the Locost, marking the official completion of the project. Since that day we've taken some very pleasant outings in the car, and over the coming years we plan to take a great many more.